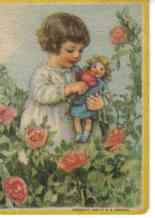 Being a tomboy growing up in Seattle during the 1970's, I was never into dolls, even when my beloved grandmother bought me my first doll at 8 years of age when I was in the second grade, which I promptly stuck in my closet & never saw again, though I do recall, she was as tall as I was, lol! Nope, my love of dolls started naturally & totally unexpectedly when I was 14 years old & browsing around at the old flea market over at the Midway Drive-In, which closed down a few years ago. I still recall that hot summer day in July like yesterday...there she was lying there like an emerald jewel amongst the grit & dirt, as the flea market was held outside with a bunch of old rickety stands lined up in row after row after row (big as a playfield)...yet, there she lay, totally out of place & breathtaking! The glint of her satiny bright forest green dress is what caught my eye first, sparkling in the sunshine. Enthralled, I immediately approached the stand on which she lay, gazing at her exquisitely painted face & long, long, long dress! Her owner, a rotund kindly old gentleman, saw my amazement & promptly went into his soft sell. I recall he told me that he found her out at an old wealthy estate in a mansion on Mercer Island. Dumbfounded, I told him I knew nothing of dolls & asked him why her magnificent dress was so unbelievably long, and that's when he explained to me what a "Bed Doll" was, and which I have never forgotten. Then I remember asking him how much he wanted for her, and he said $25, which was way beyond my poor 14 yr. old's budget. But, really wanting her, I went into my *haggler* mode, subsequently talking him down to $5! Yep, $5 bought me this unbelievably exquisite 1920's bed doll, which now sits on the very top shelf of my doll shrine in a place of honor, never to be forgotten. She remains the first, always & forever.